Parameshwari tried to have a child for 10 years. Her husband left her because she could not conceive. A few weeks later, Parameshwari discovered she was pregnant. Unfortunately, her husband did not believe her, not even when he heard she had twins, born prematurely. Now, these newborns are fighting to survive, and they need more than just emotional support to make it. Parameshwari lives with her parents, brothers, and sister-in-law. 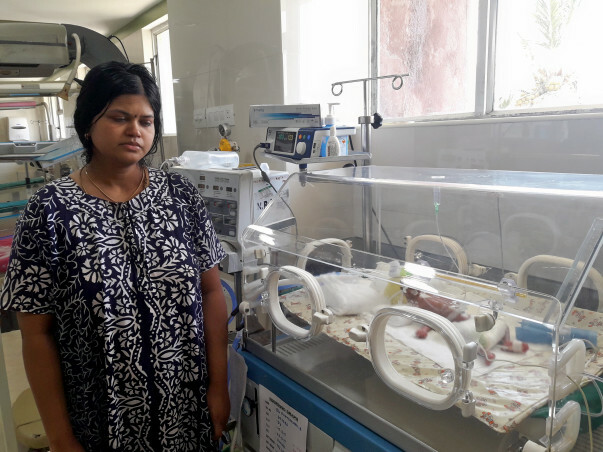 Her older brother Manivannan has been caring for her ever since she was ousted from her in-laws' place because she could not conceive. Along with his father and younger brother, he earns around Rs. 18,000 per month to take care of the household. Although he has been married for nearly 10 years, he does not have children. 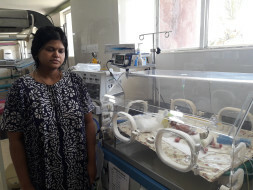 Twin A – the baby was admitted in Kanchi Kamakoti CHILDS Trust Hospital immediately after birth. Treated as Respiratory distress syndrome with surfactant therapy and mechanical ventilation. 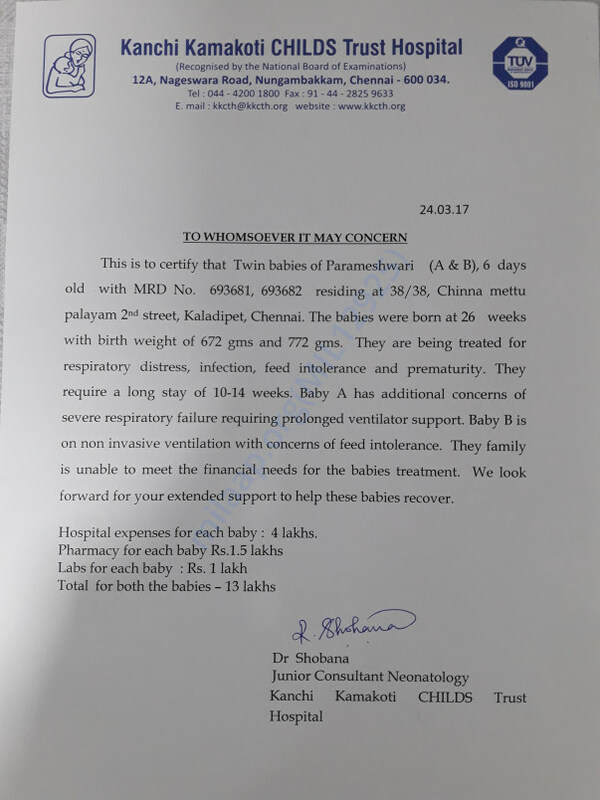 Baby remains on the ventilator in view of respiratory failure with sepsis and bilateral Severe Intracranial hemorrhage. Twin B - Treated as Respiratory distress syndrome with surfactant therapy and mechanical ventilation. Baby was extubated to non invasive ventilation on day 2 of life and is currently being treated on the lines of sepsis with IV antibiotics. "One of the twins is stable on CPAP (breathing support) and growing. Unfortunately, the other twin passed away due liver failure and acidosis after a long fight." We'll keep you posted in the days to come.